The Deebot model I bought lacks the advanced features in the Deebot 601 with App Control Deebot or the Deebot 711 with Smart Navi 2.0. Based on our experiences with an Ecovacs Deebot, however, I’m a fan of the brand. We set up Fillup (we named our Deebot) in about 5 minutes and put him to work immediately on Christmas Day. Like the models in this sale, our Deebot has Auto, Single Room, and Spot Clean modes. With Single Room mode, I put him in a room, close the door, and walk away. The robovac shuts down when done. We set the Deebot in Spot Clean mode to work on a tricky, reoccurring carpet stain, after having no luck with a spot cleaner we had tried before. Fillup went to work circling the spot and the immediate circumference. After a few minutes, the stain disappeared, and it hasn’t reappeared. We start the Deebot in Auto mode to clean our single-floor home. I read the model I bought wasn’t great with carpeting, but we have medium-pile carpeting, and the robot never has trouble cleaning it. The two Ecovacs Deebots on sale today both work with Amazon Alexa and Google Home. Each model runs for up to 110 minutes per charge and returns to base to recharge automatically. Ecovacs refers to both of the models on sale as “pet-friendly” because they handle pet hair well and emit only low-frequency sounds during operation so dogs won’t freak out. Whether you’re looking for your first robot vacuum cleaner or shopping for an impressive, sure-to-be-appreciated gift, these two deals can help you save up to $180, but you have to act today. The Ecovacs Deebot 711 Robot Vacuum Cleaner with Smart Navi 2.0 has an advanced internal mapping system it uses to clean your home efficiently. When the Deebot 711 detects a particularly messy area, it uses Max Mode to double the suction power. 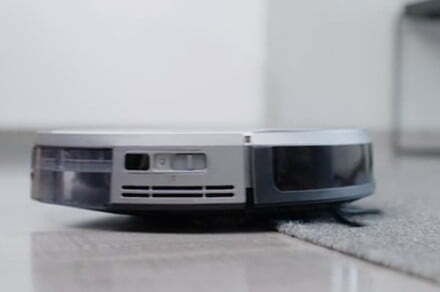 Obstacle and drop detection protect your furniture and help the robot vac avoid damage due to falls. You can control the Deebot 711 with the Ecovacs app, an included remote control, or with Alexa or Google Assistant voice commands. Normally priced at $450, Ecovacs Deebot 711 Robot Vacuum Cleaner with Smart Navi 2.0 is just $270 today. If you want an extra powerful robot vac with the added efficiency of advanced mapped, this is a great opportunity to save. The Ecovacs Deebot 601 Robotic Vacuum Cleaner with App Control is a great value even when it’s not on sale. The Deebot 601 has optimized navigation for complete, efficient cleaning and can be configured to clean on a schedule. Anti-drop and anti-collision sensors keep the robot vacuum working and its low-volume operating sound won’t disturb your conversation or your pets. You can also use Alexa or Google Assistant to start, stop, or tell the Deebot 601 to return to its charging base station. Usually $330, the Ecovacs Deebot 601 Robotic Vacuum Cleaner with App Control is on sale for only $190 today. If you’re looking for an outstanding robot vacuum at an awesome price, don’t hesitate.